This week begins my third trimester of pregnancy. For me, it's all seemed to go by so fast. My belly seems barely big enough for a tiny human to live, and it's crazy to think our little man will be here in 3 months. Ahhh! Panic! I'm actually really excited for him to get here, but there's just so much left to be done. Meanwhile, my body is still experiencing all the unusual things associated with pregnancy. 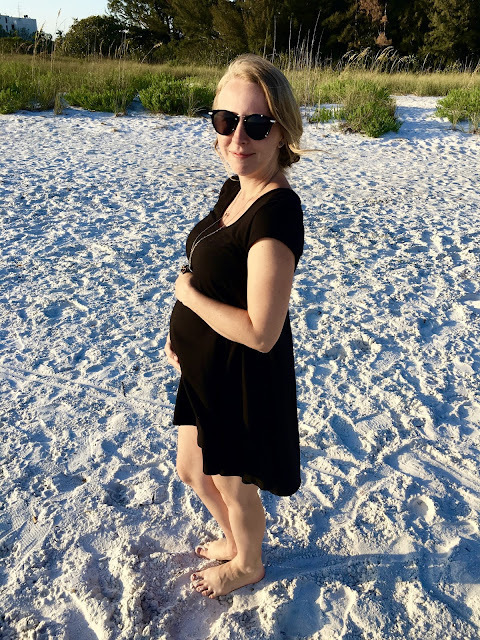 If you missed my First Trimester update on my YouTube channel you can check it out for an introduction into my many pregnancy symptoms, but today I'll walk you through the good, the bad, and the ugly of my 2nd trimester. Acne: Although switching to oil cleansing has helped my skin a lot, I'm still experiencing breakouts. Part of this is due to the less than healthy foods I've been eating. The other part is just one of the many lovely side effects of extra hormones. Leg Cramps: This new symptom has been the most brutal. Every night I get extreme pain in my legs in areas I barely knew existed. The muscles running up the side of my calf become extremely tender. I also get cramps if I stretch my leg too far. I've dealt with this symptom by stretching constantly and using my pregnancy pillow to keep my legs at a suitable angle. Sleep: Due to the aforementioned symptom, sleep has been difficult. I've always been a back sleeper, which isn't suggested after the first 5 months. It's been a difficult adjustment, but I bought a pregnancy pillow early on since I knew this was going to be an issue. I place the u-shaped pillow between my legs and under my hip behind me. This has minimized the pressure on my knees, back, and hips. It's also kept me from rolling unto my back out of habit. You can buy the same one below. Nails: My nails experienced a 2nd trimester boost in growth. I finally had to trim them when they started to look a little wild, but I definitely took advantage of my nail's new strength and length. The growth has slowed a bit now that I've made it into the 3rd trimester, but they're still far more healthy than they were pre-pregnancy. Hair: I was hoping for the magnificent growth you always hear about in pregnancy, but it never really came. I've still been losing the same amount of hair in the shower. Although I must admit my hair has been growing at a seemingly normal pace instead of its typical snail pace. Cravings: I haven't really had any overwhelming cravings except for fatty foods and sweets. I used to be a big junk food and fast food eater, so those cravings have come back. I've also been eating a lot of fruit for the sweetness as well as more ice cream than normal. I try not to indulge too much, but in general I'm in pretty good health, so a bowl of ice cream here and there doesn't hurt. Overall the 2nd trimester has been pretty smooth and relatively painless. My body has adjusted to less sleep (maybe 6 hours instead of my usual 8-9), but it's probably a good thing since my sleep schedule will drastically change soon. Get Active: I definitely haven't been as active as I should be lately. Naps have been more of my pastime than walks. Luckily, I'm almost done with work for the summer, so I can focus more energy on walking, swimming, and yoga. Stay Healthy: I've definitely gained most of my pregnancy weight in the first two trimesters. I'd like to maintain good eating habits in this last trimester to keep my weight in check. Prepare for Labor: I've already taken pregnancy and labor classes, but I want to start putting some of the things I've learned into practice. I plan on working on my breathing techniques and continuing yoga to try to keep baby in prime position for labor. I'll also get the chance to pack my hospital bag, which I'm perhaps too excited about. I've already started making a list of items, and I want to make sure I'm as comfortable as possible while in the hospital. Prepare for Baby: The office has been cleaned out, and the furniture has started to arrive, so I'll spend the next few months transforming the room into a nursery. I'm excited to see all of his little things in the house.